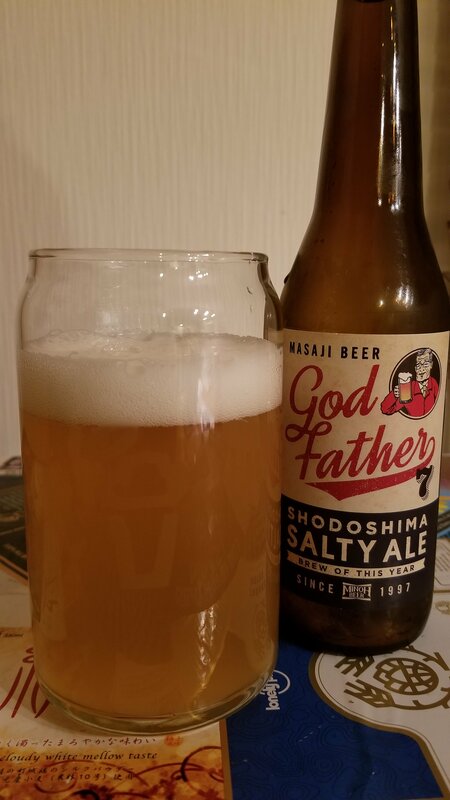 Minoh Godfather 7 Shodoshima Salty Ale, which just rolls off the tongue, is a 5.5% gose from Minoh Beer, based in Minoh, located in Minoh city, Osaka. It’s part of their Masaji Beer Project, an annual lineup of beers that celebrate the life of Masaji Ohshita, the father of the Ohshita sisters. This year’s version uses a golden ale base along with salt from the Shodoshima area – the first time in 40 years that salt has been harvested from the area apparently. There are no plans currently to rerelease this beer in any form. Minoh Godfather 7 Shodoshima Salty Ale poured out a hazy golden colour with a plump white head on tap, though that faded to a few bubbles and an oily slick inside the glass. There was a lemon pepper aroma coming off it, with some hints of sourness, but they were faint in comparison. It didn’t smell like the sea, nor did it smell like a regular gose. The body to Minoh Godfather 7 Shodoshima Salty Ale was more of the same. I was honestly expecting something bold and brash – Minoh’s seasonal and special editions can be that way, but alas, Minoh Godfather 7 Shodoshima Salty Ale was lacking. There was a meagre salty kick to it, but the malts were the star of the beer this time around. A crackery malt flavour was the strongest flavour, with very little hop flavour coming through. As it warmed up, an edge of sour bitterness came through but that faded fast. Minoh Godfather 7 Shodoshima Salty Ale had potential to be something different. But it just tasted like someone had made a beer and added a few pinches of salt to it.